With DC Comics pumping out high quality, universe-altering events like Dark Nights: Metal and Doomsday Clock, Marvel needs to put out something to compete. 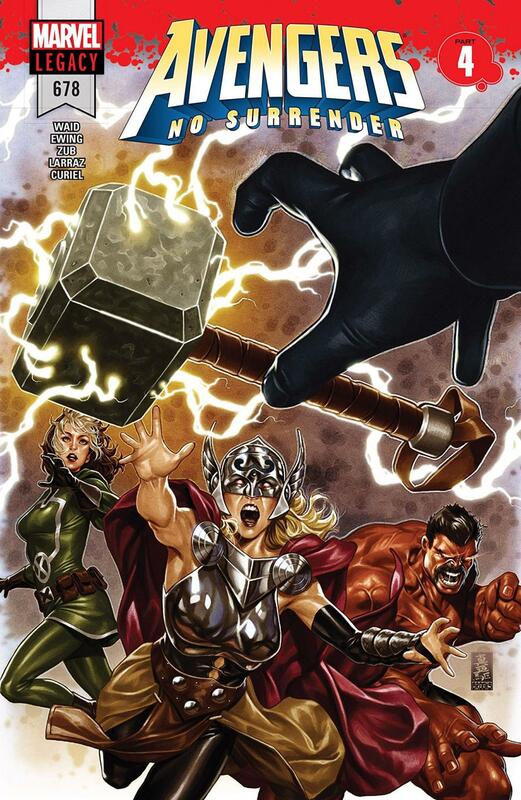 Avengers #678 is the lastest issue in the No Surrender crossover event, and seems to be seeking to do just that. To a certain degree, it succeeds, but ultimately this event is shaping up to be something to hold readers over until the next Infinity event drops. This isn't to say that it isn't entertaining, there is just very little character development going on, and much more fighting than actual substance. There are some interesting plot threads being laid out, but almost a third of the way into the event, they have yet to truly use any of them yet. The mystery surrounding Voyager took a backseat this issue, as the Avengers battled it out with the Black Order and the Lethal Legion. The fights were very fun and pleasant to look at thanks to some great art from Pepe Larraz. Cramming this many characters into a story is no easy task, and although it can become visually confusing at points, the story is doing a nice job of giving every hero a moment to shine. Even minor characters like Synapse get something to do outside of punching baddies in the background. With any luck, this book will continue to capitalize on the wealth of heroes and villains at its disposal, especially the Black Order. With the caveat that it could use some focus and streamlining as well, this series has been extremely enjoyable so far. Some character development here and there, or some lasting effects on our heroes may be too much to ask from Marvel, but if the series can focus up and push itself in new directions, it could shape up to be something special.